The Clarity Breathwork group workshop is a powerful two hour healing process that involves music, guided meditation, group exercises and a one hour breathwork session. This holistic approach facilitates a deep level of personal healing in which physical and emotional pain can be released, and an increased level of spiritual connection and creativity can be experienced. Lead by Cadence Ziegenthaler RN-BSN, Clarity Breathwork Practitioner, has a passion for empowering and supporting others to have increased health and wellness in their lives. Because she has both a traditional medical and holistic health background, she is able to draw on her diverse skill-set to help her clients find their own innate healing capacity. 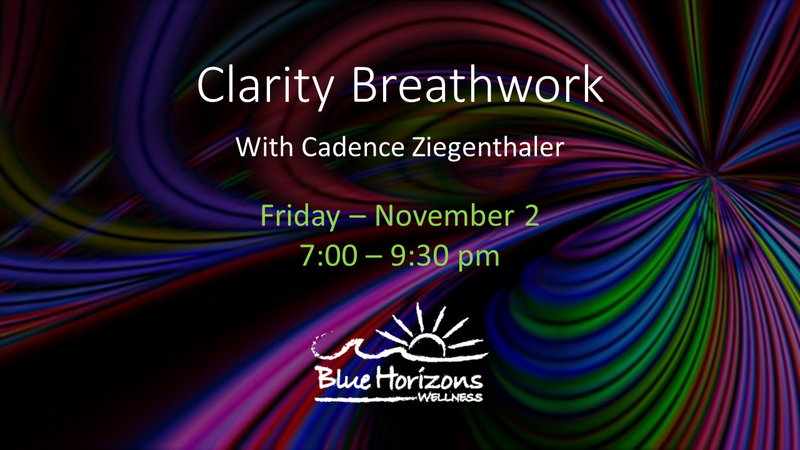 She has found that the Clarity Breathwork approach is an incredibly powerful modality in which a deep level of healing and personal transformation can occur.